Module One – This module is designed for anyone who wants to learn how to practice energy healing. You will learn; how to work with your Higher Self, the chakras (energy centers), how to use a pendulum to assess the chakras, how to safely set up a sacred space, the different colors used in energy healing and how to channel the Divine energy into the chakras to be a facilitator for healing. We will practice energy healing. By the end of the workshop you will know more about energy, how to work with it in your daily life and how to rebalance yourself and others. This is a 12 hour workshop. A basic vibrational energy healing certificate will be issued once this course is completed. Module Two – We will continue to practice the energy healing so that we become more familiar and adept with clearing blocks in the person’s energy field and raise their vibration, expanding the Light Body. We will delve further into the chakra system as well as learn about the Aura and subtle bodies. We will cover how to incorporate crystals and essential oils to assist us in the rebalancing of the energy centers. In each module, we will spend time in meditation, learning how to clear our own energy field through active light meditation. This 12 hour workshop is designed to provide the time to practice channeling the energy on each other so that we become confident and adept at giving healing sessions for all potential patients / clients. You will receive an intermediate certification for this class. 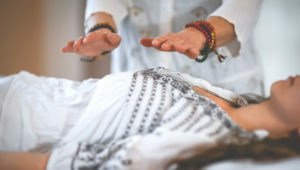 Module Three – This workshop is designed to take you further into the practice once you are comfortable with practicing energy healing.You will learn how to work with the Beings of Light, (your Spiritual Team) to affect the healing and how to channel messages. You will learn Long Distance healing, discover how to clear entities and how to work with Sacred Geometry. We will also cover the ethics and procedures involved in your energy healing practice. This is a 12 hour workshop. An advanced Vibrational Energy Healing Certificate will be issued once this course is completed. You will receive a certificate at the end of each course. You can choose to do 1, 2 or all 3 of the courses, but they must be in consecutive order. Class materials are included. Please bring a pendulum. Cost is $333 per module. Each module is 12 hours. A 15% discount is offered for those who pay for all 3 modules up front. If you are interested in learning Energy Healing, please contact me at beth@energyhealingteacher.com so I can add you to the list. This will also help me with scheduling the times and dates of the courses so that it best fits everyone’s schedule. There is a non-refundable deposit for the registration fee of $100. Cancellation policy – 72 hours notice and your money will be credited toward the next available course. “Beth is an advanced light worker that knows how to present and train anyone interested in learning energy healing work in a very easy way. Her understanding of chakras, colors and crystals as well as essential oils are conveyed in a knowledgeable format that makes learning these techniques fun and enjoyable. Beth is a very experienced energy worker and I highly recommend taking her workshop. I couldn’t ask for a better instructor.” ~Julia D.
Vibrational Healing releases energetic blocks in your energy system and returns the energetic field and body to a state of well being. Everything in life is energy, or vibration. When your energy field (the energy surrounding your physical body) is congested with energetic blocks, you will keep repeating an old pattern and get the same results. This is how you get stuck. I work with you to uncover what your blocks are and release them from your field, help create a positive new pattern that will allow you to move forward in your life in whatever area you are feeling stuck in such as your marriage, job, relationships, weight, money problems, addictions and self confidence. Experience what it feels like to be unstuck! Beth Wright is an Advanced Certified Vibrational Healing facilitator and has been practicing since 2007 when she founded her own company, Spirit Works. Beth began teaching Energy Healing in 2011. Beth was trained in Vibrational healing at the Australian Academy of Applied Parapsychology in Sydney, Australia, graduating in 2003. Beth has successfully trained over 100 people in this energy healing modality around the country.